Big-Bang Detective Work Wins Physics Nobel Americans John Mather and George Smoot (left) have won the 2006 Nobel Prize for Physics. Their work on cosmic radiation helped pinpoint the age of the universe and added weight to the big-bang theory, which holds that the universe was created 13 billion years ago in an unparalleled explosion. The Nobel Prize in Physics will be awarded to two Americans whose findings lend support to the big-bang scenario of the universe's origins. 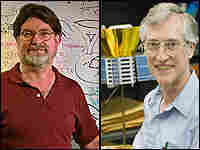 The winners are John Mather, 60, who works at NASA's Goddard Space Flight Center, and George Smoot, 61, who works at the Lawrence Berkeley National Laboratory in Berkeley, Calif. The pair led an effort to measure ancient radiation left over from the big bang. Their satellite experiment, called COBE and launched in 1989, made a very precise measurement of faint radiation produced after the big bang. When the data was finally shown at a conference, scientists gave a standing ovation. COBE's measurements gave strong support for the big bang, which was the only theory that could explain the precise pattern of radiation. The experiment also showed that the radiation had small variations in temperature in different directions. Scientists think these small irregularities explain why matter began to clump in the universe, leading to the formation of galaxies, instead of spreading out evenly. 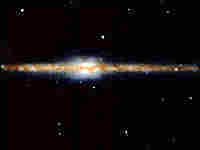 From its orbit around Earth, the Goddard Space Flight Center's Cosmic Background Explorer (COBE) captured this edge-on view of the Milky Way galaxy in infrared light. This year's Nobel Prize in Physics winners helped settle one chapter of an ongoing debate over the origins of the universe. In the 1960s, most scientists agreed that the universe was expanding, but they disagreed about how. One group adhered to the steady-state model, which held that new matter is created as galaxies move away from one another. The competing big-bang model asserted that the universe started out in a tremendously dense, hot state, and expanded with a bang into the vast and much cooler cosmos we inhabit today. Cosmologists predicted that if the big-bang theory were true, then radiation left over from the big bang should still pervade the universe. In 1964, Arno Penzias and Robert Wilson detected this radiation, known as the Cosmic Microwave Background (CMB). Penzias and Wilson won the 1978 Nobel Prize in Physics for their discovery. After 1964, researchers made several independent measurements of the CMB from Earth. But distortion from Earth's atmosphere prevented precise measurements, so cosmologists dreamed of putting instruments in space, where they could collect more detailed information. After more than 15 years of planning, NASA launched the Cosmic Background Explorer satellite (COBE) in 1989. Onboard were three major experiments. Today's Nobel winners, John Mather and George Smoot, were in charge of two. Mather's instrument measured the spectrum of the CMB, and found it supported big-bang predictions extraordinarily well. 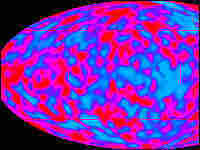 Smoot's instrument produced a visual map of the CMB, which showed that the amount of radiation varies, evidence that matter and energy were unevenly distributed when the universe was still very young. These variations -- called "anisotropy" -- are believed to be responsible for the "clumpy" distribution of galaxies and galaxy clusters. Together, these results, announced in 1992, provided the big bang with impressive support. Two newer satellites are building on COBE's findings. In 2001, NASA launched a probe -- the Wilkinson Microwave Anisotropy satellite (WMAP) -- that created an even more detailed map of cosmic microwave background. WMAP also helped nail down a number of great interest to cosmologists: It pegged the age of the universe at about 13.7 billion years old. In 2007, cosmologists plan on launching the Planck Surveyor, which will delve even deeper into the high-energy physics of the early universe. Results are expected in 2009.